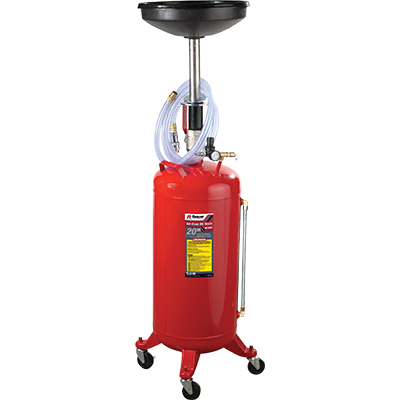 The 76 L (20-gal) RD-20SE air-evacuation oil drain and fluid dispenser is the rolling upright oil drain that'll never let you down. It sports a rugged steel construction, tamper-proof air regulator, quick-release "lift-lock" drain and a 305 cm translucent evacuation hose with quick coupler. Ranger oil drains are by far the best solution to the common problem of waste fluids. The lightweight 76 L (20-gal) RD-20SE comes loaded with exclusive features, like a tamper-proof air regulator and quick-release "lift-lock" drain. A generously wide base design ensures proper balance whether the unit is in use or rolling around the garage on its heavy-duty 76 mm ball bearing casters. The RD-20SE is constructed of heavy-duty steel for exceptional strength durability, and a handy translucent evacuation tube on the side means you never have to wonder about fluid level. All Ranger oil drains are incredibly resistant to rust, dents, automotive fluids and corrosive chemicals.